Two weeks ago the Giants could do nothing right. Sunday night at home against the red-hot Green Bay Packers, it looked like they could do no wrong. Such as life in the NFL and as life goes for the Giants, who put on a show for a National TV audience, slamming the Packers and Aaron Rodgers 38-10. 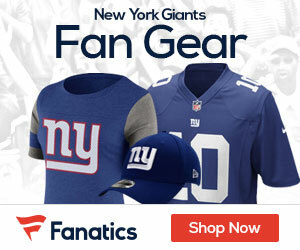 Rodgers was totally outplayed by Giants QB Eli Manning, who finally broke out of a slump with three touchdown passes. Manning was 16-of-30 passing for 249 yards. He has now thrown 200 TD passes in his career to move ahead of Phil Simms for the most in franchise history. Ahmad Bradshaw carried the ball 10 times for 58 yards and a score for the Giants, who stunned the Packers in a NFC Divisional playoff contest last season at Lambeau Field. Bradshaw also caught two passes for 61 yards. Andre Brown rushed for 64 yards and a touchdown on 13 carries for New York, which snapped a two-game skid and holds a two-game lead over the Redskins and Cowboys in the NFC East. Rueben Randle, Hakeem Nicks and Victor Cruz all were on the end of Manning’s TD passes. The news was not all good for the Giants, however, as Brown suffered a broken fibula in the fourth quarter. Rodgers connected on 14-of-25 passes for 219 yards, one touchdown and an interception for the Packers (7-4), who had a five-game winning streak snapped. Green Bay fell one game behind the Bears for first place in the NFC North. Chicago beat Minnesota by a 28-10 margin on Sunday. The Giants scored a touchdown just six plays into the game after Bradshaw took a screen pass 59 yards down to the 2-yard line. Brown then rumbled into the end zone for the early score. Green Bay responded with its lone touchdown of the contest. Rodgers used a play-action pass and hooked up with Jordy Nelson down the right sideline for a 61-yard score. The Packers actually had a chance to take the lead on their next possession, but Mason Crosby missed a 55-yard field goal. New York took over at its own 45 and went 55 yards in eight plays. Manning scrambled up the middle for 13 yards on 3rd-and-7 to keep the march alive. Faced with another third down, Manning found Randle in the back of the end zone for a 16-yard score with 2:38 left. Corey Webster followed with a big defensive play for the Giants, as he picked off Rodgers. New York had to settle for a 43-yard Lawrence Tynes field goal, making it 17-7. The Giants continued to roll on offense in the second quarter. Nicks caught a 25-yard pass on 3rd-and-9 to move the chains before Manning capped the 8-play, 61-yard drive with a 9-yard TD pass to Cruz. Green Bay responded with a 10-play, 62-yard march that took six minutes off the clock. However, the Packers had to settle for a field goal after moving the ball to the New York 11-yard line. Crosby’s 28-yard field goal cut the gap to 24-10 with 3:37 remaining. The Packers’ offense went back downhill on their next possession. 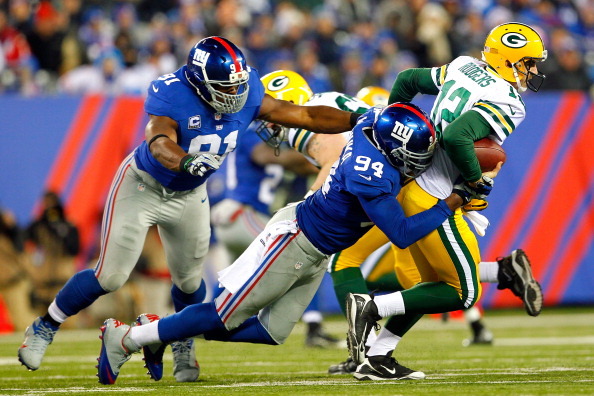 Rodgers had the ball stripped out of his hand by Osi Umenyiora and Jason Pierre-Paul recovered the ball for New York. The Giants needed just two plays to go 23 yards. After Randle caught a 10-yard pass, Bradshaw ripped off a 13-yard TD run. New York took a 31-10 lead into the locker room. New York extended its margin late in the third quarter. Nicks hauled in a 30- yard pass before recording a 13-yard score with 3:36 left. Green Bay moved the ball to the New York 14-yard line on its ensuing possession, but the drive ended on Rodgers’ incomplete pass on 4th-and-5.